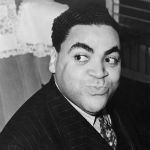 Fats Waller (May 21, 1904 – December 15, 1943) was an American jazz pianist, organist, composer, singer, and comedic entertainer, whose innovations to the Harlem stride style laid the groundwork for modern jazz piano, and whose best-known compositions, “Ain’t Misbehavin'” and “Honeysuckle Rose”, were inducted into the Grammy Hall of Fame in 1984 and 1999. At the age of 14 he was playing the organ at Harlem’s Lincoln Theater and within 12 months he had composed his first rag. Waller ultimately became one of the most popular performers of his era, finding critical and commercial success in his homeland and in Europe.